The Railstand, or Primo, is a trick where the skater ends up standing on the edge of their skateboard. You can do the trick either toe side or heelside. Toe side is also called frontside and heel side can be called backside. When you do toe side the grip tape faces your font, when you do it heel side the grip tape is facing behind you. The toe side is the easier version to learn because you an see what your doing easier. The trick is typically done a flat surface. You place your feet directly over the trucks. To do the trick you push with your toes and jump up. You need to push hard enough to turn the skateboard onto its side. 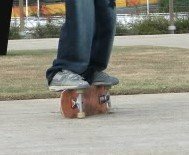 You want to land your feet so that you ar standing on both the side of the deck and the wheels. To do the heelside Primo it takes a little more foot magic. I move my back foot so that the toes on the back edge of the deck, even with the truck. To do the trick jump up and push the deck onto it sides with the toes of the back foot at the same time. Again, you want to push hard enough to that the skateboard turns on its side and you land with your feet on both the wheels and the side of the deck. I can Primo, take me back to Tricks Page!